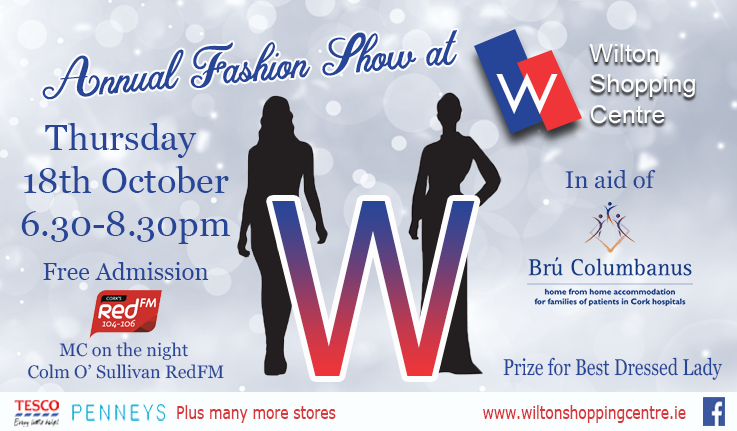 This year’s annual Wilton Shopping Centre Fashion Show is set to be a spectacular, featuring many well known and loved fashion stores eager to showcase their Autumn/Winter collections. The fashion show is taking place in the Centre on Thursday 18th October at 6.30pm. This is a must for any fashion enthusiast and will be a chance to check out the latest looks from Swamp, Penneys, Born, Tesco and many more. This will be a great opportunity to pick up some wonderful fashion tips and advice on how to dress for your shape. MC on the night is Colm O’ Sullivan, from Corks RedFm. There will be some great tunes from well-loved Cork DJ, MC Fleming. Make-up on the night will be by O’ Sullivan’s Pharmacy. Admission to the show is free and there will be a spectacular raffle on the night with some top-notch prizes to be won. Everyone who attends will receive a lovely goodie bag stocked with treats. There is also an extra special prize for Best Dressed Lady so put on your glam rags and step out in style. All proceeds will go towards Brú Columbanus, an independent charity that provides “home from home” accommodation for relatives of seriously ill patients in any of the Cork Hospitals and the Hospice.